What’s been filling my extra time. 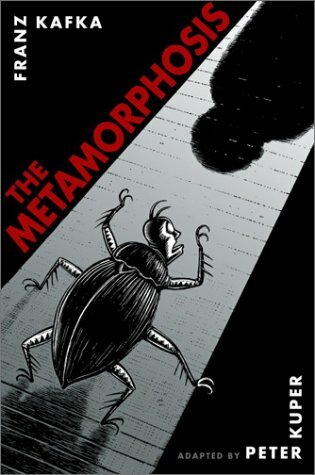 Anyone read Kafka's The Metamorphosis? I finished it prior to a book discussion this past Wednesday. A lot of this sort of eastern bloc literature is kind of "out there," but finding it unremarkable waking up to discover you've become a big insect? And worrying most about being late for work? That's more than out there. It's way, way gone. That's out of the freakin' park. I went into the discussion disliking the book, knowing I'd missed THE BIG POINT. I can't say we came to a consensus, but I left thinking the book is best explained as an allegory about a man who, no longer useful to his family, becomes shunned by them. He's an object of contempt and disgust to his family. Or, maybe Kafka was just smoking some really great crack. Who knows? I'm just not that patient with insect angst, though approaching it as allegory opens a whole new world. Too big a world to go into without boring you to death. Suffice to say it was weird, but I understand it much better now. It still depresses me to no end, but I get it. After reading some of the criticism following the text of the novella, I learned Kafka wrote a letter to his father sarcastically speaking in his father's voice, calling himself vermin and useless. There's a heart-rending letter from Kafka to his father here. No wonder the writer was so bitter. It gives a whole new spin to The Metamorphosis. Also finished a book titled Lima Nights by Marie Arana. Nothing new as far as the plot: a middle-aged man of German descent falls in love with a younger (15!! ), gorgeous and sensuous girl who's a dancer at a night club. His obsession grows, his wife finds out, and she takes their children and his mother, moving out of the house altogether. This novella is one of the supreme embodiments of early 20th century anxieties over the powerlessness and alienation of the individual in an irrational universe. Its intensity is heightened by a severely understated style and by presenting most details through Gregor’s baffled but trustful point of view. It offers a distinctively Kafkaesque parody of salvation from individual guilt and solitude. Perhsp I should have read the letters – Metamorphosis was definitely not one for me! Well done for finishing it. The title of that book is quiet interesting and the cover too. I’m reading a lot of fantasy theory at the moment, and they’re all telling me to read Metamorphosis, but… well, one day. Next Post In one week.